I Tried Essence Cosmetics Mascara. Here's What I Think. 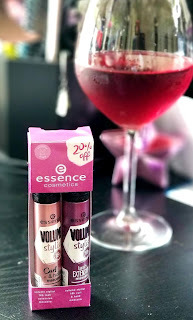 A couple of weeks ago I visited my local Ulta to re-up on some of my most used beauty products (*Cough* brow pencils *Cough*) and came across a section of a brand that I had never heard of: Essence Cosmetics. There was a nice little selection of mascara in cute packaging, and of course because I am a complete sucker for packaging, I had to try it out. Initially I picked up a single mascara (though I don't recall the type--results promised, i.e. lengthening, volume, both..). When I got to the register I asked the cashier if she'd ever heard anything about the products since I'd never even heard of the brand before and she picked up the double pack shown, saying that she'd used the Curl and Hold mascara and likes it because it gave the low lid the appearance of having been lined. She said it isn't her daily mascara, but has no problem with it. The pack shown retails for $8 and with the infamous $3.50 off Ulta coupon it came down to a little over $6. Not bad for 2 full size tubes of mascara. Immediately I tried some on, on the ride back home and I wasn't impressed. I thought it was because I lacked all the other makeup: LINER!!! and also foundation, etc. (You know how your whole face has to be made to make a final decision. LOL) But when the day came that I got all dolled up and went to finish my look with this mascara it was a FLOP! I tried one and then the other and then applied another coat of the first and then the second, and again and again and.. It was just a "NO! "I like my lashes to be full and long and these mascaras just were not taking me to LashTown. 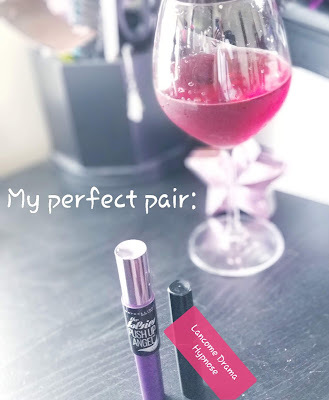 I love this combination because the Lancome mascara gives you DRAH-MAAAH! : Full, dark lashes. Go over that with the Maybelline brush and you get lash separation and plenty of elongation! Looks just like a false set of lashes. I promise you! I get compliments on it all the time. A few times my lashes have been mistaken for fakes, even. If you are looking for this sort of result, give it a try. I apply these mascaras with the brush held horizontally. Now, I give the orientation of the brush when applying because just this morning I discovered a neat little trick for the Curl and Hold mascara from Essence Cosmetics: Hold the brush vertically when applying. I'm stuck with these mascaras because I trashed or otherwise lost my receipt. Since I have them, why not use them, you know? So, today was my chance. I lined my eyes up in a proper cat eye and applied a coat (horizontally). Got the same old... Unimpressed!!! Then a thought came to me: try vertically. And it worked!! (Woooo!) I actually held the brush vertically at a slant and sort of wiggle swept. I'm satisfied with the results. It's not the dramatic lash that I go for when getting all jazzy wit it, but it's a good look for a chill day, like running errands or something. 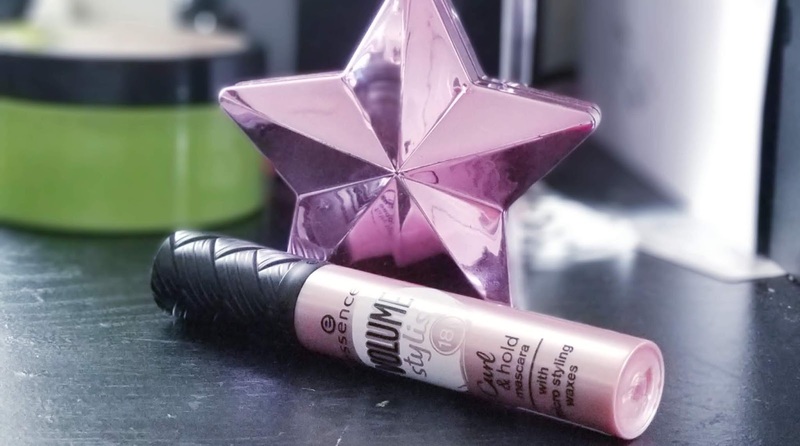 This mascara is good for those that aren't looking for a dramatic look, but maybe just a darkening of their natural lashes. Just a lil pop. Two mascaras for $8 (or less) is a good deal, and the package is cute. 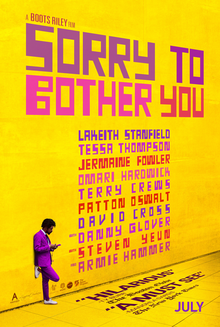 I recently watched the movie Sorry To Bother You starring Lakeith Stanfield. If you are on the fence about this one, or have been planning to see it but just haven't found the time to visit the theater yet, my suggestion is that you definitely get out to see it. It's "woke" (lol) and funny. I'm getting detailed from here on out, so if you are the type that doesn't like to learn details before you get to check it out for yourself, back on out the room now. One day an older coworker (played by Danny Glover) tells him that to excel in this position he has to use a "white voice", which he describes is a voice that says to the person on the other end of the line that life is swell. You have no cares in the world and your life/livelihood is not dependent on how this call goes. To be white is just to be. You're not vested in anything b/c, well.. life is good regardless. He takes the old man's advice and it works! Cassius becomes the star around the call center and even though he seemed to be giving his all, there comes a point when the most straggly looking manager tells him he's doing great, but he needs to give more. And I'm thinking like... Ain't this some $#%*! He's The Man in this hellhole and still you ask for MORE?! I'm incredulous over this. Like, don't you just hate when you are successful at something and someone sitting on the sidelines is all like, "But you could do better." Like.. Ugh! Welp, he works his way up to be one of a few elite Telemarketers that have a great workspace which is accessible only by a golden elevator secured with a ridiculously long code. He's making bank! Cuts his uncle a check to save the house, moves into his own apartment with a great view and buys a Maserati. He's feeling accomplished, but at the same time a bit troubled about this new role: He's selling prison labor, though the company isn't actually labeled a prison. It's known as just a regular old employer that gives you 3 square meals and a bunk bed to sleep in, in exchange for your labor. The name of the company is Worry Free and it's advertising makes it seem like a legit alternative to living in your own, personal environment and working everyday. It's so appealing that even Cassius' uncle considers it in the event that he loses his home. And I saw deeper into that. I related it to "desperate people do desperate things". When you have nothing and even your shelter is threatened because of this, a lot of people end up in jail (or in this case, Worry Free.) That desperation of trying to make a way out of seemingly no way. It's a very sad reality here in America, the world capital of incarceration, where you can be attacked by the government's foot soldiers (cops) and even lose your life for selling cigarettes or DVDs to make ends meet. So, not to get too into the lil twist, I'll just end this by saying he learns of a really messed up plan the owner of Worry Free has to gain more product output and profit from this extremely cheap labor and he foils the guy's plans, but it may be a tad too late to save himself. This movie touches on human nature/behavior and society as a whole and reflects how at the end of it all, most are all out for themselves, naturally. You can begin as a part of a pack, but once your time comes, you gone! Those you once rocked with are left to fend for themselves. Your morals twist to find things acceptable that you usually would not. And this is all for a buck (and in this day and digital age just plain old fame with no fortune attached at all). Money. Success. What drives the ego kills the self. Is that last line too deep?? Anyways, there is more to the movie. Other characters add to the plot and all. This post is just really what stood out the most to me while viewing it. Go see for yourself and let me know what you think. Did you like it? If there is anyone that has visited this site in my initial days as a blogger back in... (I don't quite remember.. but it was yeaaaaaaarzz ago), you may recall my weekly entertainment videos on current events as well as reality television shows. Vlogging in this manner was fun for me back then. I have a great sense of humor and I like knowing what's going on in the world. To blog and vlog about this stuff are just natural activities. Unfortunately, I had gotten away from this dealing with life. Sometime other ventures. Sometimes just a waning of interest or maybe even laziness. I do have a narrow attention span most times. I'll love doing something and suddenly it's like the most uninteresting thing to ever do, you know? Many (people, places, things) have been victim of this mindset of mine thousands of times. Wouldn't you know... I've picked right back up like I never left. During my breast cancer battle last year, I blogged and vlogged quite a bit, covering my diagnosis and treatment, but that wasn't fun. Wasn't entertaining. I hope it was informative, but it's not the kind of topic I like to cover, you know. My opinion on reality TV drama?.. That's fun(ny). So, the past 2-3 weeks I've been watching Basketball Wives and trying desperately to catch up on Season 10 of Real Housewives of NY to bring the world laughs with my opinions. Here's my latest vid. 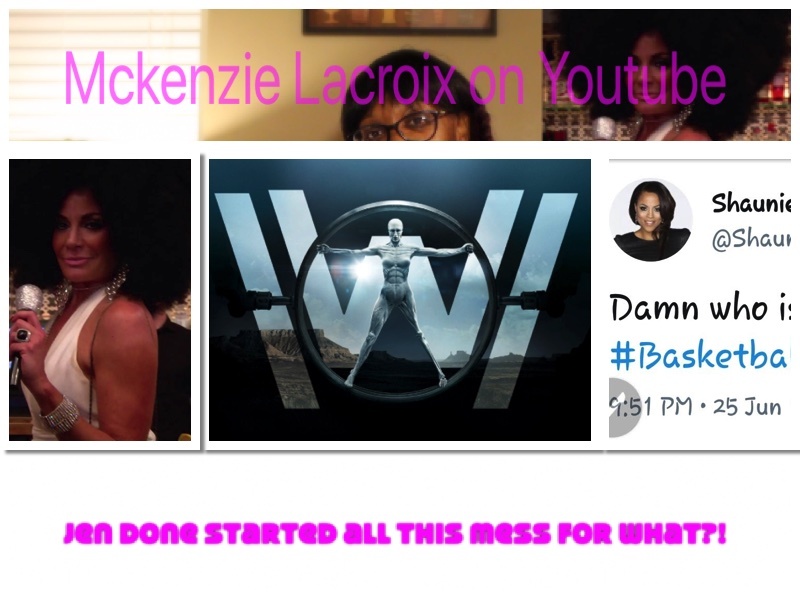 It's a lil long & rambly (think I made that word up), but enjoy my thoughts on the latest episode of Basketball Wives.